Caring for a senior loved one can be challenging for family caregivers, and though there are many tips available for making this experience easier to manage, it can be easy to forget how effective bonding can be. 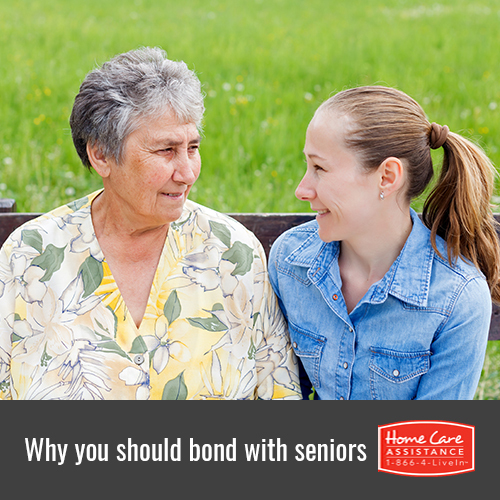 Building a bond together offers a number of important emotional, physical, and mental benefits for both you and your loved one, and here are just a few. Providing home care in Guelph for your loved one can sometimes be overwhelming, which can damage the relationship you have if you aren’t careful. Being able to form a strong emotional bond can help you maintain a happy and healthy relationship with your loved one, no matter how stressful taking care of him or her becomes. This has the added benefit of boosting your loved one’s emotional wellbeing, which can make caregiving easier for you. Creating and maintaining a bond with your loved one can help you become a more effective Guelph caregiver and help you feel more appreciative of the important role you play in your loved one’s life. This helps ensure you are meeting all of your loved one’s complex care needs on a regular basis instead of just taking care of his or her basic needs like cooking and grooming. Though caring for your loved one may be stressful at times, having a strong bond with him or her can help ease this burden by making caregiving more enjoyable. This helps reduce the amount of stress you experience on a day-to-day basis, which can make caregiving a more rewarding experience. Reducing stress can also help both you and your loved one stay healthy by lowering blood pressure and decreasing the risk of depression. Establishing and maintaining a bond with your loved one can also make providing Alzheimer’s or dementia care in Guelph easier to manage. Forming strong bonds with your loved one can help boost his or her brain function, leading to fewer issues with decision making, memory, and other cognitive tasks. Even if you form a strong bond with your loved one, you might have some difficulty meeting all of his or her care needs. This is where Home Care Assistance steps in to help. We match a caregiver to your loved one based on personality, interests, experience with health conditions your loved one has, and many other factors to ensure they form a bond. To learn about how our in-home care services can promote your loved one’s quality of life, call one of our qualified Care Managers at (519) 954-2111 to request a no-obligation consultation.